Mass transit, as much as it is a means to take smog emitting cars off the road, still sometimes creates pollution in its own right, especially with regards to the many buses roaming cities around America. Cleaner fuel burning buses help combat this, but still some pollution tends to be emitted. What is a possible solution? Electric-powered buses, which is one thing electric vehicle start up Proterra seems focused upon building. EarthTechling (ET): Talk a little bit about the history of Proterra. What was the inspiration for starting this company? Jeff Granato: Proterra was founded by Dale Hill in 2004 with a vision to design and manufacture world leading advanced technology heavy duty vehicles that are powered solely by clean domestic fuels. Hill formed Proterra to develop and deliver the “bus of tomorrow”, based on the 2030 Federal Transit Administration vision for public transit buses and to address the increasingly urgent environmental needs. With the launch of the fast charge EcoRide BE-35 battery electric bus, Proterra has become the leading innovator of zero emission commercial vehicle solutions. Proterra’s products help transit agencies deliver clean, quiet, rider and neighborhood friendly vehicles that also meet government regulations and local mandates while also eliminating the use of fossil fuels. Early in 2010, Proterra announced its plans to build a full scale, state-of-the-art research and development center and manufacturing plant on the campus of CUICAR (Clemson University’s International Center for Automotive Research) in Greenville, South Carolina, giving them access to tremendous research and development resources while they build the EcoRide BE-35, next generation zero emission vehicles and FastFill Charging Stations. The goal is to construct more than 1,500 buses per year (with room to expand to more than double output) and to grow the company to 1,300 employees over the next five years. We have already moved its manufacturing from Golden, CO headquarters to its Phase I assembly plant in Greenville, SC to meet current demand. 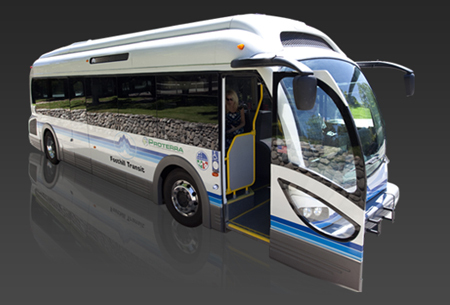 ET: Proterra you say is building green buses. What makes them eco-friendly specifically? Granato: Proterra’s EcoRide BE35 buses are all electric requiring no diesel fuel. Unlike any conventional or hybrid-electric passenger bus available on the market today the EcoRide BE35 bus significantly reduces air and noise pollution for riders and communities, while dramatically reducing vehicle operation costs for transit agencies. Proterra provides transit agencies with an alternative option to the high carbon emission diesel run buses, reducing air pollution and the community’s dependence on oil.